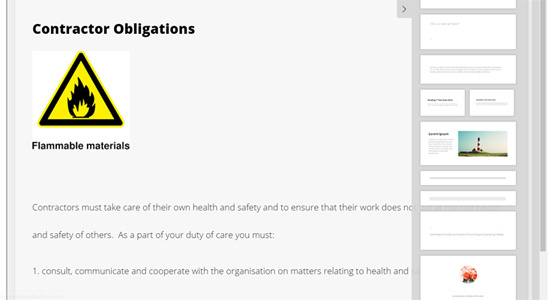 Using our slideshow builder you can create your own safety induction presentation from scratch. A simple drag and drop interface, build online slides with text, images, insert videos, animations, sound and more. Create as many slides as you want and if you are struggling for content, point, click and choose from our massive safety course library so that you can have a truly customised but site specific safety induction for your workplace. Don't waste hours, days or weeks trying to create a slideshow from scratch, just use our templates and change the text as necessary. We've got it all! No matter the industry, pick from a matching safety induction and start using it.